I’ve always avoided climbing Mitsutōge. Sure it’s steeped in history and tradition, but I just couldn’t overlook the TV antenna flanking two of the mountain’s three sacred peaks. During my last trip to Kawaguchiko, I opted for neighboring Kurodake, a higher flank and one of the 300 famous mountains. The vistas across the lake to the northern face of Japan’s highest mountain were tranquil if not inspiring, as few hikers visit its tree-lined heights. Mitsutōge, on the other hand, is crawling with visitors no matter the time of year nor the weather. A quick on-line search revealed a plethora of English-language blog posts and trail notes, coming in second to Mt. Fuji itself. Yes, the peak would remain off my Hiking in Japan site, but perhaps, I reasoned, it was still worthy of a quick exploration. I arrived at Kawaguchiko station by bus from Matsumoto, and immediately swam through the sea of crowds to the coin lockers tucked away on the western side of the station. It took quite some time to sort through the kit and repack, and after a short trip to the restroom to deposit a load of a different kind, I scooted over to the bus information counter to inquire about the next bus to the trailhead. “The final bus just left”, came the response from the weather-beaten brows of the bored attendant, obviously worn down from the constant inquiries of visitors looking for the tourist information counter. I was counting on the 10:35am bus to the trailhead, but I was informed that this bus only ran on weekends. Dejected but still determined, I popped into the 7-11 to stock up on lunch. The clerk was particularly inquisitive yet relieved when I told her that Mt. Fuji was not my intended destination. Back at the station, I easily hailed a taxi for the 5000 yen ride to the start of the hike. After passing by a troupe of foraging monkeys, the driver eased the vehicle along the exposed shoulder that followed the narrow mountain stream, depositing me at a large pile of snow piled up at the unmarked bus stop. I bade my chauffeur farewell and stared up at the ice-covered forest road directly in front of me. I took a sip from the water bottle before strapping on the 4-point crampons, whose spikes easily bit into the hard ice. This deserted road led me higher towards the western flank of the mountain, terminating at a small car park sparkling with a clean restroom. From here, the trail lay buried under 50 centimeters of fresh snowfall. The crampons did little other than to serve as a depository for dense, wet snowfall, and after every third step I had to kick my feet together to dislodge the burdensome clumps of white clay. Still, it was better than having to sit down on the moist snow to unbuckle the crampons, so I held out until a bit higher on the slopes, where the snow conditions improved under the cool winds. I soon passed by a party of four sporting blue jeans and sneakers. I kicked steps past them as they looked on with an air of envy. If there’s one thing I’ve learned in all my years of spring hikes in Japan, it’s to expect the unexpected and always carry the 4-pointers. The wide path, which I am pretty sure doubles as a gravel highway in the summer, switchbacked through the sleeping forest towards the summit plateau. The going was easy as I simply followed the other footprints from like-minded mid-week summiters. An unmarked jeep sat on the shoulder of this path, buried up to its neck in wind-blown drifts. Perhaps the hut owner uses this mode of transport in the green season? Another jeep lay parked a bit further up the path, where a signpost led the way to Mitsutōge-Sansō, which I reached just a few minutes later. It was high noon and time for a snack. I settled into a bench that had luckily been swept free of snow and peered across the steep valley towards the puffs of cumulus that held Mt. 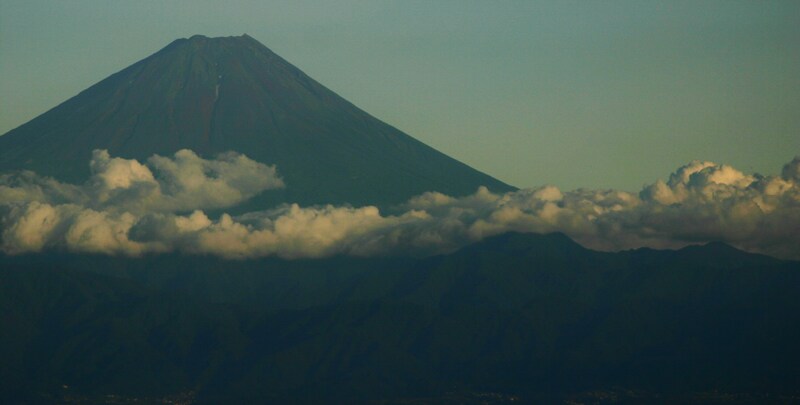 Fuji in its grasp. Oh well, so much for the views of Fuji that draw thousands of climbers throughout the year. Crowds were beginning to converge from all directions as I retraced the route back to the hut and along the ridge to a second hut and junction down to Mitsutoge station. The second, and highest of Mitsutoge’s triumvirate is a knobby knuckle by the name of Kaiun, reachable on a series of half-buried wooden steps. 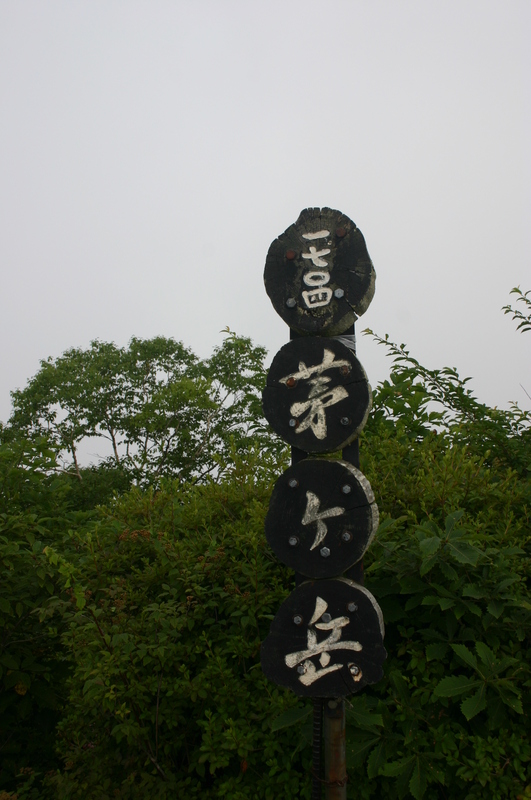 The summit signposts indicated that this was indeed Mitsutoge mountain. a huge disservice to a peak that literally means ‘good fortune’. Despite being usurped of a name, the weather did bring me the good fortune of viewing the entire chain of the Minami Alps clothed in a wintry white which was a pleasant consolation prize for not being able to see Fuji. Sharing a mountaintop with twenty of my closest strangers does not rank high on my fulfilment list, so I dropped down the northern side of the summit, past a towering antenna, and down through the forest to an unmarked junction. My feet led me further to the north to the final summit Takanosu, literally ‘the hawk’s nest’. The mountain was impossible to miss, thanks to the virtual city of TV antenna that would make for a great place to bring up some hawk offspring if not for the electromagnetic waves. The summit was not only deserted of people, but severely lacking in summit signposts as well. Perhaps they were buried under the foot of snow blanketing the top. Satisfied, yet hardly done, I looped back around to the junction below Kaiun and dropped steeply down a flight of slippery wooden stairs. The path dropped to a saddle and then, by complete surprise, turned left and traversed directly under the cliffs of Byobu-iwa that make Kaiun such a mecca for Kanto-based rock climbers. Though no spidermen were visible on this outing, the line of pitons fastened to the rock face suggest that the belay times on weekends must rival those of the queue at Space Mountain, but this is not a hypothesis I would even want to prove. The only rock climbing you’ll see me do is when I’m forced to do so, on the near-vertical routes in the Japan Alps, where fixed chains and ladders make the going easier. As the path dropped lower, I took off the crampons and coasted past a series of Buddhist statues to a mountain pass adorned with stone Jizō. From here, it was a snow-free tramp through the darkened forest until popping back out on the pavement, where it was a dreadful walk of about an hour on the asphalt jungle. As soon as I arrived at the station, the skies opened up in one of those familiar spring downpours. This rain continued overnight and changed to snow, so when I woke up the following morning in Kawaguchiko, it was a winter wonderland. I wandered the sleeping streets before dawn in search of a nice place to capture the morning light on the cone. Although I doubt I will visit again, it was good to have marked the mountain off the list. The peaks surrounding lake Saiko look worthy of further investigating, a chance that I hope to seize in the more comfortable green season. March 21, 1971 is a day that should long be remembered among those with an affinity for the Hyakumeizan. A short distance below the rocky summit of Mt. Kaya, Kyuya Fukada, famed alpinist and author of arguably the most influential mountaineering book in modern Japanese history, succumbed to a brain hemorrhage while admiring the beauty of the purple iwakagami wildflowers. 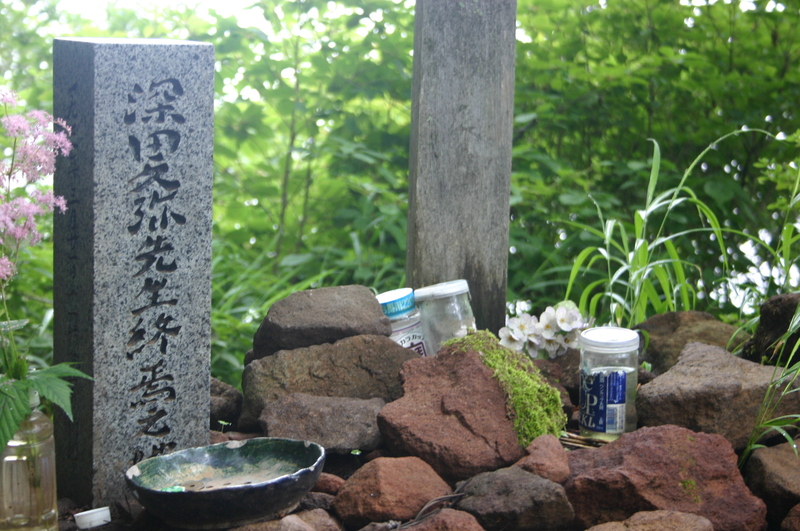 Ever since finishing my own ascent of the 100 mountains, I’d wanted to pay my respects to Mr. Fukada by climbing the peak in his honor, but timing was always an issue. Respiratory ailments have continued to haunt me over the last year or so, sometimes making simple strolls quite an ordeal, so could I muster up enough physical strength to endure an 800-meter vertical ascent? Joining me on the auspicious early August expedition was none other than Julian Ross and his brilliant dog Hana, who both completed their own Hyakumeizan challenge around the same time as myself. They are now well on their way to finishing the 100 famous peaks of Yamanashi Prefecture, of which Mt. Kaya is a proud member. At a little past 6am on a cloudy weekday morning, the 3 brave souls started their epic climb. First stop: Kyuya Fukada park. Set up as an ad hoc memorial to the Hyakumeizan author, the overgrown, wooded picnic area has definitely seen better days, as the namesake recipient himself would at least wanted to have a view of the Japan Alps instead of a neglected area at the end of a desolate forest road. After a quick prayer, we set off at a snail’s pace up the well-used path. Having experienced a mild asthma attack the previous evening, I set a conservative pace that had Julian admittedly concerned about my well-being. Indeed, my previous record of turning back on easy peaks had broken my confidence, but the only way to overcome my crutch was to face it head on by testing the cardiovascular system. 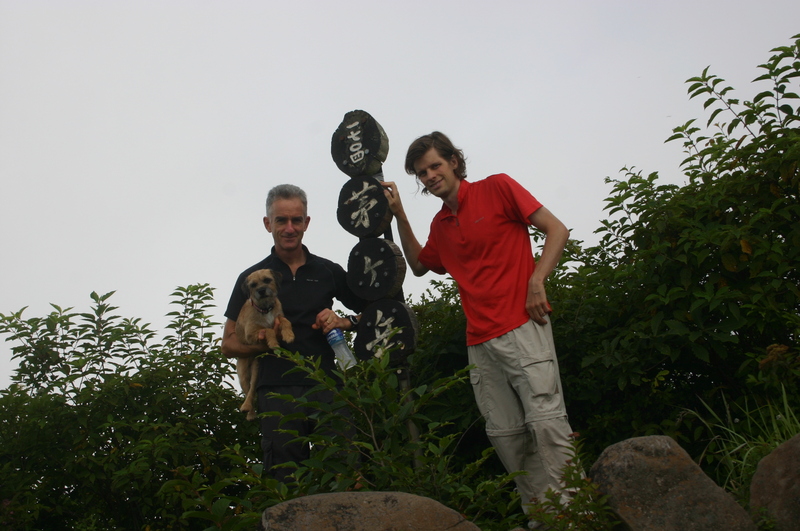 Steadily we rose above the valley, arriving at Lady’s Rock (女岩) with a pace faster than the allotted map time. My asthma was somehow held in check, perhaps by the spirit of Mr. Fukada himself. Halfway through our climb, I once again took the lead through the endless switchbacks to the ridge line, keeping a relatively slow but steady gait. After all, we were well ahead of schedule and had absolutely no view through the low cloud cover. The air hung thick with humidity, as the unseasonably hot summer air penetrated even the higher elevations usually accustomed to cool winds. The trail took a sharp turn towards the left once reaching the ridge line, where the views towards the north started to open up. 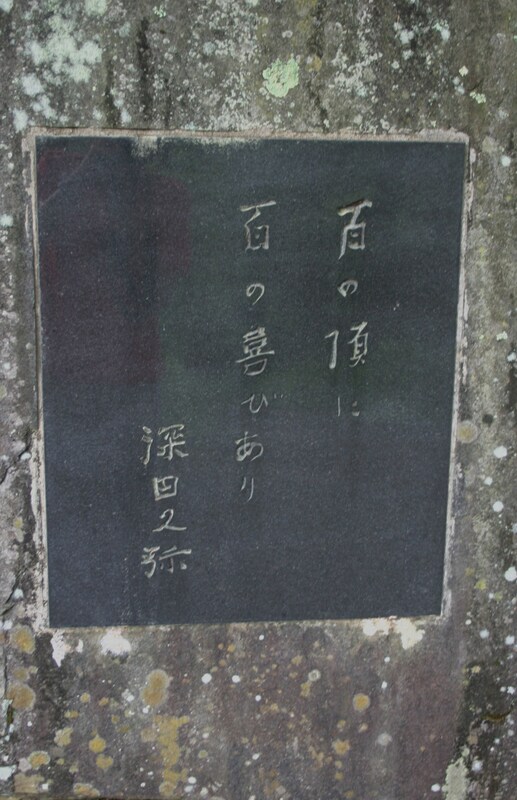 A short climb later, we found ourselves staring at a modest stone pillar marking the exact place where Kyuya Fukada left this earth. A brief moment of silence ensued, as both Julian and I wondered aloud whether Fukada made it to the summit or not before he met his maker. Onwards we pushed, as the terrain turned summit-esque with appearance of large boulders. “Less than 100 horizontal meters”, quipped Julian from behind. Good timing as well, as the chest began to tighten, signaling potential respiratory interference. It’s a good thing the summit were only a mere 1700 meters above the surface of the ocean rather than a monstrous 3000 meter peak. The clouds held their grip on the mountain, and we were left without what the guidebooks describe as a stellar panoramic view. Summit photos were taken before we retreated the way we came. The chest didn’t bother me on the way down, as we were both able to enjoy a speedy descent back to the parking lot. I felt my first sense of accomplishment in a long time, especially considering it was my first successful summit of any mountain since the spring of 2009. I also experienced a strong feeling of closure in my Hyakumeizan quest, similar to the Shikoku pilgrims who return to Koyasan after their 88-temple journey to pay homage to Kobo Daishi. Thanks Mr. Fukada for providing me both the inspiration and the excuse to travel all over this land knocking off spectacular peaks. Your influence will not be forgotten.